Oh Julia this is just adorable. And a cute little name !~ I've been MIA for a few real "LIFE" issues that needed me. Hoping to start blogging and creating TODAY!! You made me smile with this extra cute creation. Enjoy a lovely weekend. This is the cutest Julia. Love the vintage change purse for her face and head. Just adorable. You are so creative my friend. you, my dear Julia, are absolutely amazing. 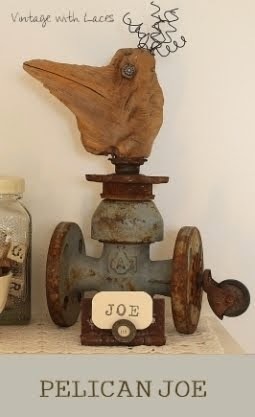 I adore all your found object sculptures. They tell stories. Sewphie is a great addition to the circle of friends. They are all friends, aren't they? No hidden jelousies, no bad feelings? This one is sew incredibly clever - WELL DONE! Oh Julia, sie ist so wunderbar, bin ganz begeistert! omg, I love everything about her!! Her name, her head, her feet, the zipper at her dress, .... amazing! You are so creative. I love it that every single thing has something to do with sewing. Gorgeous work! What a joy she is! Such a personality. Oh Julia, your creativity knows absolutely no bounds my dear!!! I love Sewphie from the tips of her hair to the tips of her darling toes! I just can't get over how darling she is!!! And you cracked me up with 'not knowing what goes on at night' remark. You have such a sense of fun that I love about you, from the tip of YOUR head to the tips of YOUR toes!!! Just when I thought your found object creations couldn't get any sweeter, along comes Sewphie Zipperbutton. I love everything about her! She's perfect from the top of her coin purse pin head to the bottom of her zipper foot feet. Amazing!!! This is a most delightful stitching character! Of course being a sewer myself, I recognize and appreciate every body part and accessory she displays. The coin purse head with the pins sticking out is so incredibly clever. I think I have all the parts (including an antique coin purse) that I could almost make her a friend. LoL. She probably has enough friends. I just love her and your story about her and your other characters. What a fun make and a fun post. Sewphie is CHARMING! You've created a girl whose personality shines through at first glance. I know I would love her! Julia, what a creative "maker" you are! Lol Julia, Sewphie is just gorgeous. I love everything about her. Her shy smile, her gorgeous hair (it looks like mine on my good hair days) and her shoes, OMW. Love her to bits. She is fabulous!! I love her "feet".! O.M.G. I think I'm in love!! That's the cutest thing I've ever seen!!! Pinning! She is gorgeous, dearest Julia, so wonderful with her coin purse head, and all the sewing notions, just by hand !! Love all you used, to create her, to be one of a kind, and so cute with her green eyes, taking notise, of every possible sewing adventure !! Wonderful how you also created her own little world :-) around her . Have a lovely weekend, sweetie, I hope you are fine !!! Love and hugs to you, friend !! Sie ist einfach nur GENIAL! Ich bin verliebt in diese tolle Kreation Julia! Julia, du bist einfach eine Meisterin der Recycling-Skulpturen! Eben habe ich mir alle Freunde und Freundinnen von Sewphie Zipperbutton noch einmal angesehen... sie verdienen alle einen 2. Blick! Deine neues, feines Mädchen ist mir so vertraut, findet sich doch sämtlich von dir verwendetes Material auch bei mir, einschließlich eines ähnlichen Ledertäschchens ... doch niemals käme ich auf die Idee, so eine lustige Person zu schaffen. Das machst du unschlagbar wunderbar! Julia, Sewphie is beautiful and you are a genius! I can't get over how much detail you put into her and how amazing she turned out! You are such an inspiration, friend!!! Oh Julia! She is fabulous -- so very imaginative and creative. I especially love her sewing machine feet but every little detail shows such inspiration and joy. You must be pleased with this one -- I hope you are, for she is worthy of praise. Very nice! So clever that she is made entirely from sewing notions (except for the change purse, but that is so cute too). I really love the tiny bolt of fabric she is holding. Schön, dass ich mit meiner "schwarz - Welle" nicht alleine bin;-)! Dein Kasten wird sicher super superschön!! Und ich bin mir ganz sicher, du findest passende Griffe:-)!!! Well! Wonderful to meet you, Sewphie! (I love your name! ).It is very much apparent that you once worked in an office, since your apparel is polished and impeccable. You are well equipped, I see, and ready for the slightest wardrobe malfunction, whatever that may be. Do tell me where you shop? Your designer has custom created a most delightful dress and it complements your figure beautifully! ich bin immer wieder überrascht, wie kreativ du bist. Deine Sewphie ist sooo hübsch geworden. Ganz toll gemacht. Sewphie is so mega wonderful I don't know where to start. I've been looking at her for well over five minutes, maybe ten. She has such a lovely kind face and a pretty ornamental hair style (or hat?). How cleverly you have used each item to make her. I love her rolls of fabric too, and I can see she is clutching one roll in a determined fashion. And her feet!!! I can see she might be popular with the other characters as she looks so friendly and interested in life. Julia you are such a gem, as is your Sewphie, love the play on the w words. There is so much attention to detail here and that is what makes her so special. Her cute little feet, the purse she is holding and all these things created from objects that we normally find in sewing machines or in sewing boxes. She truly is a gem! Julia, What a treat to be introduced to Sewphie. She has the sweetest smile and I am sure she has the kindest heart with maybe just a wee dash of mischief in her eyes. I am in awe of you. Not only do you combine the various elements in such a genius way but I love that you bring such character and personality to your junk people. I forget they are not real people! I think we want their to be romance somewhere because the thought of some baby junk people - that is just too adorable! Julia, you never cease to amaze me. I absolutely love Sewphie! Your attention to the details is what really makes your junk people come to life, and the wonderful Sewphie is no exception. I can't say enough about how amazingly talented you are. I simply adore her and I always look forward to seeing what you'll be creating next. So much fun! Beyond fabulous.....I LOVE repurposed items and this one is just so clever! Julia, only you could manage to bring me back to my sewing days with FOND memories in mind! :) This gal is a beauty! 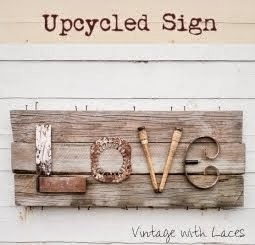 Featured you this weekend's DIY Salvaged Junk 350. Thanks for linking up! Mein grosses Kompliment für dein lustiges Nähmädchen (und auch am Namen habe ich grossen Gefallen ;-)). What an amazing creation :) I love it!! Wonderful! Sewphie is the cutest and love everything about her from the sweet smile to all her design elements and notions. You are so creative and love to see what you make. So adorable & creative!!! And what a great use of so many different sewu=ing parts!!! OMG she is adorable...I love her face and her feet are so creative. Sewphie is styling! This is fantastic! I love everything about her! Oh my goodness she is just the most clever and amazing girl EVER! I cannot get over all the detail. Beautiful work! Sewphie is just the cutest gal I've ever seen!! ♥ What a wonderful creative idea. I just love her! I'm behind with my blog reading but finally stopped by to see this fabulous girl. You, my friend are just genius! Wishing you a very Merry Christmas and Happy New Year, Julia!!! Thanks for all your creativity and inspiration through the year. Merry Christmas dear Julia and happy holidays, to you and your family. Thank you for your kind visit and friendship. Ich wünsche dir auch ein zauberhaftes Weihnachtsfest im Kreise deiner Lieben! Ein frohes Neues Jahr liebe Julia! Ich hoffe Dir geht es gut und ich würde mich riesig freuen bald wieder was von Deinen genialen Werken hier bewundern zu dürfen! Miss Sewphie Zipperbutton is gorgeous! Came back for another visit to see your sweet Sewphie, love the name. She is so very neat and love what you have made her from. Hope all is well with you and many thanks for the kind visit to my blog. imagination, créativité, recyclages, cocktail que j'adore !